This event relocates the Belgian Army, from Brussels where it is initially deployed in the variant setup, to Antwerp. See variant 4.0 Belgian Army initial setup. The placement of von Kluck’s 1st Army in the Brussels space portrays more accurately the historical itineraries of the German armies invading Belgium: the 2nd and 3rd Armies converged towards the pivot of the manoeuvre, to meet Lanzerac’s 5th French Army. The 1st German army on the right of the invading wing swept through Brussels, then bore right and pressed on towards the heart of France. Check map. The overblown military ambitions of the Austro-Hungarian Dual Monarchy were actually responsible for sparking off the Great War, and should not be ignored. The guns of August also thundered in Russia and the Balkans. 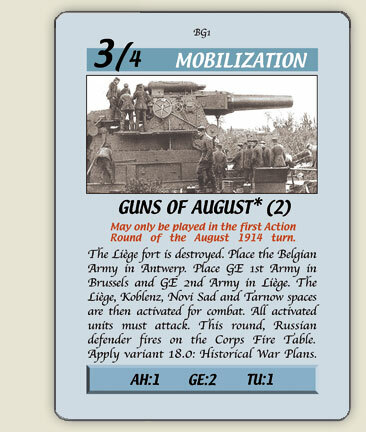 The card calls for mandatory combats whose probable outcomes are intended to reflect the balance of forces at the time of the opening assaults into Serbia and Russia. The activation of the Tarnow space represents the focal point of the offensive into Galicia. The Austro-Hungarian 1st Army benefited from numerical superiority (10 divisions vs 6.5) and flanking position against the Russian 4th Army. Their right wing routed, the Russians were thrown into confusion and began to retire. Check map. Since the set-up situation (3 AH combat factors vs 4) did not render the Austro-Hungarian early advantage, I made the Russian defender fire back on the Corps Fire Table to give Dankl’s 1st Army an opportunity for some initial progress. The odds of the mandatory attack against Serbia are poorer, in accordance with abysmal historical performance, and the offensive is thus very unlikely to succeed. Check map.